Scunthorpe United will be without striker Deon Burton for six to eight weeks after he tore a medial ligament. The 37-year-old former Jamaica international has missed the Iron's last two matches and a scan has now shown the extent of his knee injury. Dave Syers, David Mirfin, Sam Slocombe and James Severn are also out injured. "Our physio has never know anything like this. We've had five serious injuries now and a lot of bad luck this season," said manager Russ Wilcox. 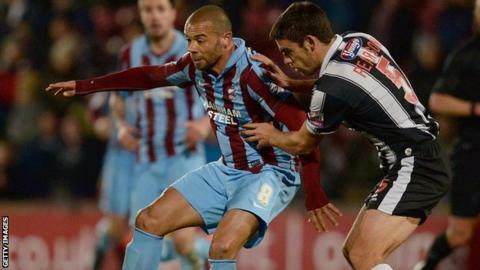 Meanwhile, defender Andrew Boyce has extended his loan deal with Grimsby Town by a month. He has started all five of the Mariners' Conference games so far this season.